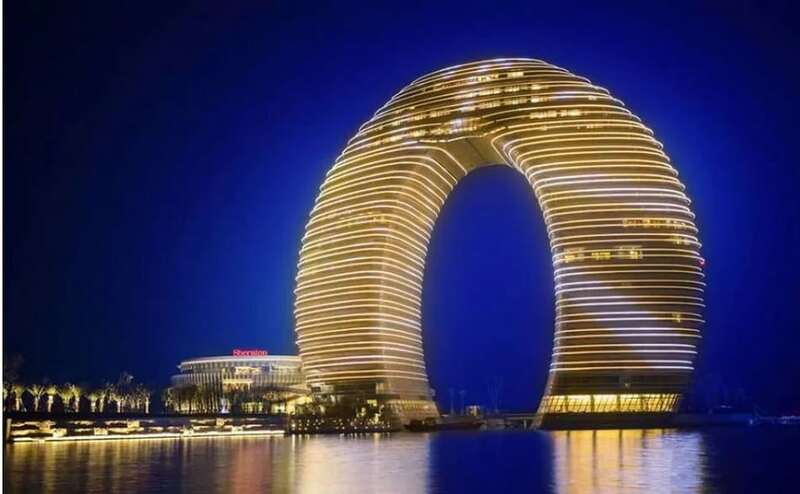 This is a stunning hotel and resort with a famous Torus geometrical shape which integrates into the surrounding environment. The shape of Sheraton Spring Resort has earned it other names, such as “Donut Hotel” and “Horseshoe Hotel”. This 4.5-star resort offers 27 stories of pure luxury, housing 321 rooms, 40 suites, and 37 villas. It goes on further to include a presidential suite, 4 restaurants, cafe, fitness center, parking facilities, among others. Located on the edge of Taihu Lake, the building’s iconic shape is reflected in the waters – making it extremely photogenic. This is truly a must-see hotel resort with impressive lights and architecture.